Take thirty year old party girl, Kate, shove her in rehab for an undercover assignment to land her dream job, which she originally blew because she showed up still drunk from the night before. Add the ‘it girl’ of the moment, actress Amber Sheppard, that Kate is to get the scoop on, many dark tales of addiction and this is where we find Kate struggling to have it all. Catherine McKenzie’s engaging debut novel has proven her as one to watch. Her voice is fresh, new and compelling. Spin is a witty, fun, laugh out loud novel, yet had a grittier subject matter and I absolutely could not put it down. I found the heavier subject of addiction offset nicely by Kate’s highly entertaining thoughts and antics along the way, so it didn’t come across as too heavy, nor did it feel too light. Kathryn felt this might have been made a little too light, but I think that comes from the first person perspective. Kate doesn’t take rehab seriously because she feels she obviously doesn’t have a problem with alcohol, so it does come across this way at times, but I think it’s a reflection of her character, rather than light being made of the subject. Kate’s character is full of flaws, yet she’s vulnerable, funny and just wants to follow her dreams, but seems to keep getting in her own way. I rooted for her throughout her journey of self discovery. Kate’s character wasn’t the only quirky one in the bunch and the supporting characters were all so well developed that I ended up cheering them on as too. My only concern when I started reading SPIN was the lack of specific setting. This novel could take place anywhere and at first I wasn’t able to get grounded in a place, but this disappeared almost immediately and I found it unique to be able to picture this taking place almost anywhere. 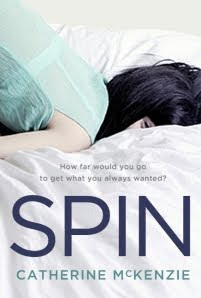 I loved Spin, will probably reread it and will definitely be putting Catherine McKenzie on my must read list! Add this to your summer reading! Better yet, go get it now! To be very truthful at first I felt like I was reading the movie 28 days. I think that in the end though that should be taken as a compliment to the author because she wrote a novel about a difficult and not at all funny topic and made it light enough that you felt like you were reading a blockbuster film- does that make sense? Kate is trying to get her dream job at a music magazine but unfortunately blows the interview as she’s sort of still drunk from the night before. Instead she is offered a job following the latest “it girl” to rehab where she must befriend her and write an exposé. I found the story a bit depressing at the beginning and just wanted to shake Kate out of her stupor but it was funny so I kept giggling and then going back to being mad at her. It was once she enters rehab that you begin to understand her actual personality a bit more- I guess because she’s not being outrageous due to alcohol. I loved the original story line and it was refreshing to read a chick lit novel that tackled some harder topics while still keeping it light, entertaining and readable. It reminded me a little bit of the Marian Keyes novel Rachel’s Holiday which I loved years ago. I was a little disappointed in some of the predictability towards the end of Spin - hence my rating, but all in all it was really worth reading. Thank you to HarperCollins Canada for our review copy!